David Taylor CARTER (father), Pleasant Point, Timaru. Later of Mt Gay, Hazelburn, Timaru. Height 6 feet. Weight 174 lbs. Chest measurement 36-39 inches. Complexion fair. Eyes grey. Hair brown. Sight and hearing both good. Colour vision correct. Limbs and chest well formed. Full and perfect movemnet of joints. Heart and lungs normal. Teeth good. Free from hernia, variococele, varicose veins, haemorrhoids, inveterate or contagious skin disease. Vaccinated. Good bodily and mental health. No slight defects. Operation scar of appendicitis. Hill 60 (New Zealand) Memorial, Hill 60 Cemetery, Turkey. Pleasant Point Cemetery - memorial on parents' headstone. Pleasant Point Cemetery - General Section, Row 3, Plot 204. David Roger CARTER, known as Roger, was the youngest son of David Taylor CARTER, one of the oldest settlers in the Pleasant Point district, and Elizabeth Maud nee CUMMINGS, of Rockpool Farm, Pleasant Point. Roger was born at Rockpool on 12 February 1892 and baptized at St Alban's Anglican Church at Pleasant Point on 18 March 1892. He was already making his mark at school in 1904 - at the Hazelburn School annual prize-giving he gave two recitations in a hearty manner, and he won Standard VI prizes for reading and spelling and for arithmetic, and in the boys' class for flags hand sewn. Next he studied at Waitaki Boys' High School at Oamaru, for which he gained a place in the senior free place examinations in 1907, and where he was successful in the Civil Service Examination in 1908. Roger worked as a farmer on the home farm, Rockpool. He was serving in the Territorials when he embarked for the Front In February 1915, only two months after enlisting, and reached Egypt on 27 March. On arrival he was appointed lance corporal and rejoined the Main Body. He became a sergeant but reverted to lance corporal on 23 August 1915. Four days later he was killed in action at the Dardanelles. His brother Francis received private advice from one of Roger's comrades-in-arms that Roger was killed by a shell. By October 1915 more than thirty ex-pupils of Waitaki Boys' High School had given their lives, among them David Roger Carter, whose name was recorded with pride in the school's Roll of Honour. They, along with well over 200 on active service at this time, conveyed "very concrete and convincing instance of the effect of the imperialistic training that has characterised the school for so many years". A deeply impressive service in memory of the ex-pupils who had lost their lives in the war was held in the Oamaru Opera House on 12 December 1915. The service opened with the singing of the hymn "Oh God! Our help in ages past" to the accompaniment of the 10th Regimental Band, followed by prayers, biblical readings, the hymn "For all the Saints, who from their labours rest", the reading of the Roll of Honour, the playing of "The Dead March in Saul" and a lengthy address by a minister of religion. The singing of National Anthem and the sounding of the Last Post concluded the service. A similar service was held on 4 April 1920, but now the Roll of Honour was much longer - 118 old Waitakians had given their lives for God and Empire. Roger and many others were remembered and honoured by their Alma Mater. He was remembered again at the Hazelburn School prize-giving in 1915, this time for having given his life for "the great cause" - serving King and country. In January 1918 at a farewell for another departing soldier and presentation of medals to returned soldiers at Totara Valley, Roger was named as one of five soldiers who could no more on earth answer to the roll call. An item in the Otago Daily Times of 6 October 1916 reads as follows - "Mr D. A. Menzies, Toogoolanan, Australia, has received a letter from a friend in the British forces at Salonika, in which he states that when on Gallipoli he picked up a watch from the side of a New Zealander who had been hit by a shell. The watch was not of much monetary value, but it would be of sentimental value to the soldier's parents. On the back of the watch was inscribed 7-827 D. R. Carter, intimating that the owner belonged to the Canterbury Mounted Rifles." Roger's brother Francis John CARTER was the sole executor of his will and the administrator of his estate. Roger had bequeathed all his property to his three brothers - Francis John, James Quartly and Cecil Robert, and his sister Selina. His brother Robert Cecil CARTER died of wounds in France in 1918. The two other brothers, James Quartly and Francis John, were listed on the Reserves Roll. The Carter family was active in the Hazelburn district, Mr Carter serving on school committees and Mrs Carter supporting patriotic funding through the Hazelburn and Raincliff Guild. David Roger CARTER is remembered on the Timaru War Memorial, the Hazelburn District War Memorial and the Waitaki Boys' High School War Memorial. 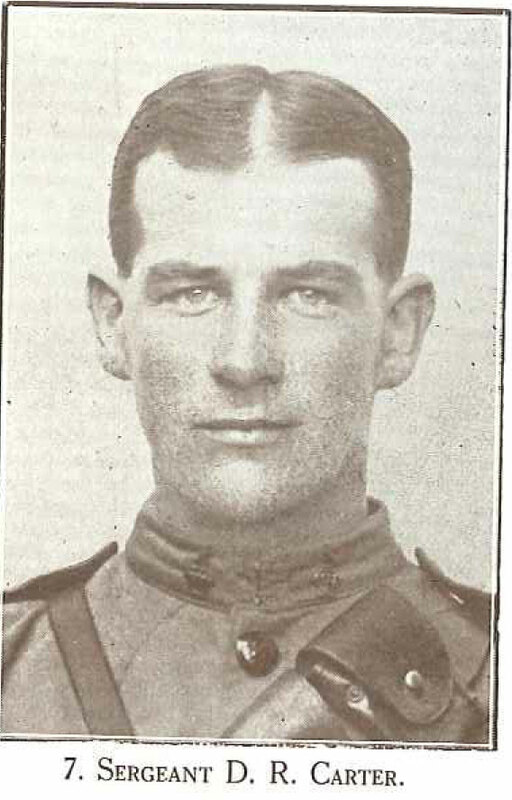 A photograph of David Roger Carter is printed in "Onward: Portraits of the NZEF", Volume 1. .